H2R is here for families like John* and Mae*. John lost his longtime job and steady paycheck. His wife, Mae, is physically unable to work and receives disability benefits. After losing his job, John took employment when he could, but wasn’t able to find the same level of pay. The drastic loss in income finally took its toll. And, it was while he was working as a truck driver that he, Mae and their son became homeless. The couple, now in their 50s, and their pre-teen moved into their truck. “Things got tough, and we couldn’t afford the place we lived,” Mae said. “The plus side is that the truck was registered … It’s scary though.” Unregistered vehicles can result in fines or even be subject to seizure. The family would have been at risk of losing not only the means to its small income but also its temporary shelter. 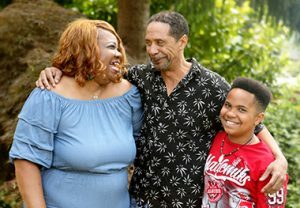 Searching for help, John and Mae called the county resource line, 2-1-1, and were connected to Jewish Family Service and the Homeless to Renter (H2R) partnership. H2R helps families who are experiencing homelessness move-in to safe, permanent housing. When the family came to JFS, John was about to start a new job, and they had set their sights on a place. While they could pay the monthly rent, they did not have enough for the deposits. Through JFS and H2R, the family received financial assistance to help cover a portion of first and last month’s rent, as well as the security deposit. “That one step that you just can’t make, JFS helped us make that step,” Mae said. After meeting with a case manager, they were also introduced to the Polack Food Bank and provided a bag of food before they left. Mae’s family was just one of about 30 families that the JFS and H2R partnership helped in the last year. As the affordable housing crisis has grown, JFS receives around 90 calls a week about rent and move-in assistance. Even for those who find their way into affordable housing, it’s not always easy to keep up with the rapidly rising cost of living in the region. “It’s been a struggle,” Mae said. Two weeks after the family moved into the new place, they received notice the rent would go up. While the family was able to continue paying rent on their own, JFS continued to provide support and accountability through periodic check-in calls. Mae said she looked forward to receiving those phone calls. “That’s the extra drive people need,” Mae added. Helping people achieve stable housing, and ultimately better well-being and health, is a multi-step process, noted Susan Rogel, JFS Director of Emergency Services. JFS and the H2R partnership provide one-time eviction prevention during a family’s first year back in housing. JFS also provides eviction prevention funds to individuals and families who have already received eviction notices. Housing funds for this partnership come from H2R, a program of Temple Beth Am. Temple Beth Am members also provide handmade afghans for H2R clients. JFS provides case management to clients and advocates for them throughout the rental process.